India is home to one of the most vibrant, engaged and mystifying democracies on the planet. Cambridge academics, across a wide range of disciplines, are working on the ground – with citizens, charities, NGOs, fellow scholars and politicians – to try to untangle it. In a remote village in a forgotten corner of West Bengal lives an old man called Fakhruddin Gazi. He has lived in the village for every one of his long years. However, since India was partitioned in 1947, Fakhruddin Gazi has lived in fear, unable to leave the small landholding his family has owned for generations. A thousand miles away in Rajasthan, the state’s first female Chief Minister is showered with garlands and the kind of affection usually reserved for pop stars, not politicians. The masses clamour to touch her feet. Devotees deify her with all the reverence of a Hindu goddess. Just down the road in Jaipur, an enterprising and popular middle-aged man is making and receiving calls on one of his three mobile phones. The conversations he conducts link voters to politicians, slum-dwellers to local officials. If you need a fake birth certificate, a government job, or your home connected to the electrical grid – his is the number you need to call. In Gujarat, a casually employed labourer is being interviewed. The man is a Dalit, a member of the lowest caste in India’s order of social stratification. Dalits used to go by another name – ‘untouchables’. He tells Dr Manali Desai, who has travelled from Cambridge to interview him, about his political leanings. This is India on any given day. A cacophony of more than a billion voices and stories all straining to make themselves heard. Some shout, some whisper, others scream. Few are silent. Each and every voice – Brahmin or Dalit, Muslim or Hindu, old or young – has something unique to tell us about the nature of democracy in India: its flaws and foibles, its puzzles and paradoxes, its successes and its shames. All have their part to play in informing our understanding of the world’s largest democracy; a democracy often celebrated, regularly condemned and impossible to ignore. Some of the stories Cambridge academics are uncovering – like Professor Joya Chatterji’s experiences with Fakhruddin Gazi – interrogate the foundations and principles of post-partition democracy, highlighting a legacy of injustice and inequality against a sub-class of India’s own citizens. The work of others, like social anthropologist Dr Anastasia Piliavsky, directly challenges the Western world’s accepted notions of what democracy should look like, arguing that our rush to brand Indian politics as a basket case of corruption and crime is, in part, a failure in our own understanding as to the needs and sensibilities of more than 800 million registered voters in India. Chatterji’s work on refugees, minorities and the rights of marginalised groups in West Bengal and beyond raises questions about the history and meaning of citizenship for minority communities in India, particularly for individuals like Fakhruddin – an Indian Muslim caught on the ‘wrong side’ at the time of partition. Once the head of a Sunni family that owned several acres of good paddy land and many heads of cattle, Fakhruddin has lived with the consequences of partition since the late 1940s. In the upheaval that came with the new international border and the Radcliffe Line, his family fled to East Pakistan (now Bangladesh) while he stayed to tend to the graves of his ancestors. Gangs grabbed most of his property and burned his home while the police did nothing. In 1965, India enacted ‘enemy property’ ordinances that gave the state unfettered powers – which could not be challenged in any court – to seize the property of anyone ‘fraternising with the enemy’. Since then, Fakhruddin has been afraid to leave the tiny plot he still has, for fear of being dispossessed. “My work looks at the origins and precise nature of minority citizenship,” says Chatterji, Director of the Centre of South Asian Studies. “Unless you understand its legacies of impoverishment, deprivation and seizure of property, addressing contemporary problems of minorities in India’s democracy will be less straightforward. Chatterji has made extensive use of records kept in the National Archives of India, and many regional archives across the subcontinent, to supplement extensive fieldwork and oral history. Despite the current status quo and unwillingness of governments to tackle the issues surrounding minority citizenship, Chatterji does have hope for the future. Sociologist Dr Manali Desai is another researcher with an ambivalent view on India’s future. Her recent work has looked into the reshaping of the country’s political landscape and how the ruling BJP party (historically seen as conservative and elitist) has won the significant backing of many lower-caste voters in states like Gujarat. While the rise, and aspirational voting habits, of the Indian middle class has been much discussed and documented, Desai believes that the BJP’s paradoxical success in attracting voters from the Dalit and Other Backward Classes (OBCs) – when the personal benefits of voting BJP cannot be demonstrated – has a great deal more to tell us about 21st-century India. 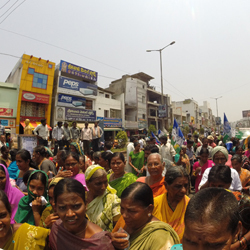 Desai believes that it is precisely the BJP’s ‘development discourse’ that has attracted lower-caste votes in high numbers despite many Dalits and OBCs continuing to face widespread discrimination, lacking access to water and electricity supplies, and being subject to evictions and relocations. ‘Development’ and ‘peace’ were words often uttered in interviews, something the BJP juxtaposed with an ‘unruly and chaotic’ past. Looking to the future, Desai says: “I am both hopeful and not. The established order of things was stultifying the economy and politics, and new technology and innovation, an increasingly young population and a new awareness of India’s place globally are all very positive developments. India’s democracy is a subject of consuming fascination to Anastasia Piliavsky, who in 2013 went on the campaign trail with Rajasthan’s future Chief Minister Vasundhara Raje. She was given privileged access to Raje’s campaign machine and the chance to understand what Piliavsky calls “the logic of Indian democracy” – an oxymoron to many. Politics and corruption in the world’s largest democracy are never far from the headlines, either in Indian newspapers or on news websites around the world. A Google search for ‘Indian corruption’ returns almost as many hits as ‘Indian democracy’. Piliavsky’s research occupies the liminal area between the two as she seeks to understand why a political system so often regarded as corrupt and amoral continually engages hundreds of millions of voters – and attracts turnouts which are the envy of many Western democracies. Piliavsky believes that looking at India solely through the prism of Western sensibilities misses the moral significance of ‘relationships’ and ‘community’ that underpins all Indian politics – subjects that Desai also came across regularly in her interviews with Dalits and OBCs. She contends that attachments to people, rather than ‘left’ or ‘right’, is what draws many into political life and shapes political loyalties. Voters expect politicians to give, be it food, money or public goods, as part of their responsibility to the voters. Many do not see the distribution of food and alcohol as corruption. To them, the betrayal of relations is the real meaning of corruption; when people don’t deliver to those whom they owe. Getting anything done in India – from buying a car, arranging a marriage or attracting voters – requires ‘approaches’. Cash does pass hands, but there are few quick and easy sales. Each arrangement works through bonds of mutual sympathy, favour and trust. Few in politics can avoid spending large sums of money on their constituencies. As well as defending a democracy often compared with the scandalised governments of Sub-Saharan Africa, Piliavsky is also more sanguine than many Western commentators about Modi’s Prime Ministership. “Most of those who voted for Modi did so because they believe him to be a highly effective leader, a man who can get things done. However sound that belief may be, delivering on his many (often improbable) promises is what will keep him in office – not backing a violent ideology rejected by many Indian citizens and the international community alike. Having promised millions of new jobs and having brought many Muslims to the BJP, Modi can now ill afford communal riots. 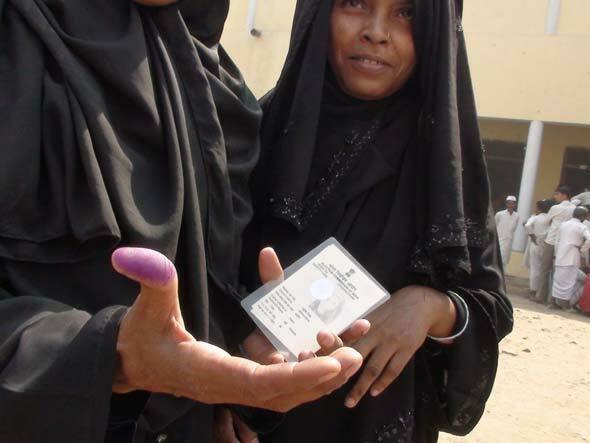 Inset images: Election campaign in the 2014 General Election in India (Michael Bumann); A woman shows her inked thumb as proof of voting (Nilanjan Chowdhury/Al Jazeera). To complement the work of Cambridge researchers studying Indian democracy, the University is also active as a neutral and respected convener of debates in India among Indian politicians, writers, artists, economists and diplomats. Following the success of the inaugural India-Cambridge summit in 2012, the Vice-Chancellor's Endowment Fund supported a major conference in Delhi in February 2015 on 'Nehru and Today's India', which was broadcast on NDTV, one of India's leading news channels. Both events were conceptualised by Dr Shruti Kapila (Faculty of History), who also provided Indian election analysis for Al Jazeera and Bloomberg TV, and has inaugurated a seminar series on Indian issues in the House of Lords.